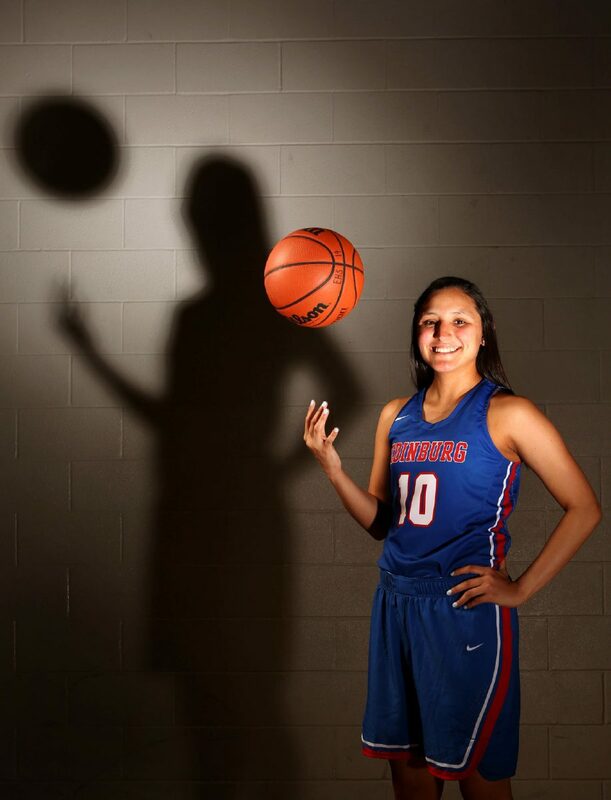 All-Area Player of the Year Jayla Santa Maria of Edinburg High. The Bobcat senior scored a career-high 747 points this past season. EDINBURG — When Jayla Santa Maria was a freshman during the 2014-15 season, Edinburg High coach J.D. Salinas placed a large amount of responsibility on her inexperienced shoulders. Picked to finish sixth in the district that season, the Bobcats won 23 games and finished third in District 31-6A with the help of Santa Maria’s 11.7 points, 7.7 rebounds and 3.0 steals per game. The milestones kept coming for Santa Maria: district superlatives, three more playoff appearances and capturing The Monitor’s All-Area Defensive Player of the Year award during the 2016-17 season. But Santa Maria saved her best season for last. The forward blistered through much of the Valley’s best competition in 2017-18, scoring a career-high 747 points (18.7 per game) while averaging 8.2 rebounds, 3.4 steals and 2.2 assists per game for the Bobcats. Santa Maria adds another feather in her cap as The Monitor’s All-Area Player of the Year. Santa Maria isn’t exaggerating. The Bobcats were a force during her final season on the court. Santa Maria was one of four Bobcats who averaged at least 8.9 points per game. Four of her teammates grabbed four or more rebounds per game, and three players posted at least three steals and two assists per game each. Edinburg High went undefeated in District 31-6A and dominated much of the Valley. Twenty-three of EHS’ 31 wins in 2017-18 were by 15 points or more. The Bobcats also spent the majority of the regular season ranked as the No. 1 team in RGVSports.com’s weekly girls basketball top 10 poll. To top it all off, Santa Maria helped Edinburg High reach the area round of the playoffs for the first time in her career following three appearances in the bi-district round. The Bobcats advanced past the bi-district round of the UIL Class 6A state playoffs after putting away Los Fresnos 43-28 on Feb. 12. Edinburg’s season came to an end four days later in Corpus Christi with a 58-53 loss to Laredo United and former EHS head coach Rachel Carmona. Trophies, wide margins of victory and scoring 2,207 career points aside, one moment stood out to Santa Maria more than the others. As one part of her basketball career ends, Santa Maria would like to begin another next year at the collegiate level. With Santa Maria moving on, Salinas and the Bobcats program will have to do the same. But not before reflecting on a player instrumental in the resurgence of Edinburg High girls basketball.